It amuses me when a fisherman makes a catch, and within a short time the area of catch is swarmed with other sportsmen trying to get in on the action. Most all, only to find their mad rush to the target zone is futile, and in weeks to come the fishing pressure on that location continues to grow, producing little if anything for the sportsman’s efforts. Much the same with activists for the TarSands production, XL & NorthernGateway pipelines protest. So many people yelling about the sprinkler system being laid out to feed supply demands at export points for refineries, while the technology for extraction of “Methane” from Hydrates continues to escalate to feed production energy to the tarsands via the Mackenzie Valley Pipeline, to increase Tarsand production by 6x if not more. Yep, can not feed those new sprinkler heads without increasing production rate from the tarsands. Imagine that, dissolving permafrost zones by thermal stimulation to extract methane, which is being sold off to the public as “natural gas production.” This great venture by the extractors has been going on for some time now and people are too busy chasing the mad rush to the activism fishing hole, while new technologies such as fracking has been introduced into the methane extraction research concepts for cost effective, viable production techniques to melt the planet more. Perhaps more people should be addressing that Mackenzie Valley Pipeline and the upcoming Methane extraction nightmare, which will make shale fracking and a sprinkler system for the transport sector look like a cake walk for environmental degradation. While the ozone continues to get purged with methane, extraction technologies are being “refined that will enhance global warming”, activists are ganging up on pipelines, while prospects in GreenLand, IceLand and the Artic are becoming accessible for the extractors due to the loss of ice caps, it’s really is a stinking joke! Exploration Wells: 32 industrial exploration wells in the Mallik field and surrounding area in the Mackenzie Delta-Beaufort Sea region that allowed construction of temperature-depth profiles using regional heat-flow values, temperature at the base of the ice-bearing permafrost, and models of thermal conductivity with depth. 3.1.5 , Note: that in this study we_did_not address potential practical problems,or safety concerns, involved in the heating and injection of CH4, but concentrated instead on the study of general strategies that can maximize production. Count on regulations for this upcoming technology to be cheesier than Shale fracking. Anyone care to guess what happened in the Gulf of Mexico? It’s not as if BP’s exploration plan did not have 2 well bores set apart from one another that mirrored Mallik’s test production well plan (close enough in design to be considered an exact footprint). And, that the casing design was of a new concept. Thinking BP figured it could handle punching into a hydrate zone of that magnitude, while methane expands as much as 160x as it breaks free of the hydrate state. That’s quite the rush of pressure as it increases exponentially in route to the surface. So much for risk management. Spit off the face of the Earth “Again”, by the Tuscaloosa Trend! On Tuesday, the Agency for Natural Resources and Energy (ANRE) started the world’s first offshore production test to dissociate methane hydrate and extract natural gas off the coasts from Atsumi Peninsula to Shima Peninsula in Japan (Daini Atsumi Knoll), and confirmed the production of natural gas…. On March 12, 2013, the world’s first attempt of natural gas production was started as a part of the technical preparation that is required towards commercialization of methane hydrate. The invention could radically transform the economics of shale gas and landfill gas development, transportation, and purification. TOKYO, March 12 (Feb. 2013 Reuters) – A Japanese energy explorer said on Tuesday it extracted gas from offshore methane hydrate deposits for the first time in the world, as part of an attempt to achieve commercial production within six years. 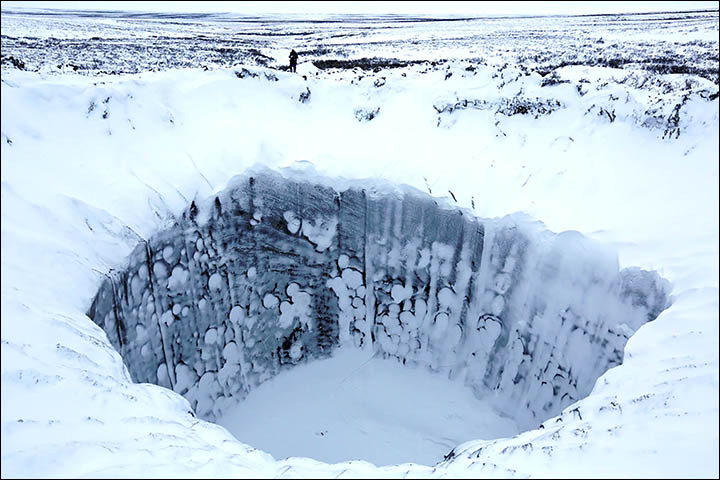 Free’d Methane from fracking and melting permafrost zones will never migrate to the Surface from a 1/2 mile depth (less in many other prospects) , Right? Just what is the plan to layer the earth with reynolds wrap to capture that crap to stop it from leeching into the atmosphere? Connect the Dots: The Yamal peninsula of North West Siberia, the Russians have been going at refining Methane Production concepts since the late 60’s (not the most environmental conscious people, they are the global leader for space trash levels) , and also in the Siberian Traps, it’s no wonder that area is one of the Earths hot spots for methane seepage concentrations. Who (TNK BP Russia) has a trendy working relationship with PetroVietnam of the infamous White Tiger fields, kinda nice that the u.s war efforts unspent flight arsenal was dropped at select locations prior to aircraft returning to their carriers during the VietNam war, which provided such great sounding for Rockerfeller seismic acquisition in those days, and next, it’s off to the S. China Sea Theatre with Cluster Bombs for more Cluster #%^*#’s, Guess where the unspent arsenal will be dropped next to image geological formations. Duh! Maybe the US Geological Survey did not find enough Lithium and other rare earth minerals in in the midst of the Afghanistan war!, which is great for green technology rechargeable energy systems , it was only something like a trillion or so in value, right? Will pass on discussing Kadafi and Chavez’s hijacked gold fortunes for now. The extractor industry has always been controlled by the transport sector. Over the years, Oil Barons have been buried as a result of not being able to get their product to market, nothing out of the ordinary going on these days, i.e except the latest and greatest techniques for melting the Earth. Korea, India, Japan, China, Soviet Union, N. America all currently have targeted prospects for methane extraction, and all are currently racing to see who will be the 1st to turn up the Heat as never seen before, rant, rant, rant …. while Japan shoots for 2016-18 to start methane production. Happy Easter , Egg Heads! Take Off the Hat of the Beast! Look at the likes of George Soro’s & Rockefeller funding and grants > Tides, 360org/sky1/Occupy ect, going to POSER ACTIVISTS such as Rikki Ott, Indigenous Environmental Network, Wino na LaDuke’s Honor the Earth , etc, tons of grant money to bury and distort media and the attention of the public, i.e redirect away from the core of concerns. Rikki played the game real well with the BP Oil Spill and nothing came out of her efforts for people in need in her so called “changing the end game”, thou her performance did a great job leading the public to believe she was accomplishing something and made for her great book sales purchased with funding and handed out along the gulf coast with her signature. Shove that grant money through book sales right into her pockett while she collected donations at a 1000 dollars a pop from people that believed she was there to help, even took in free room and board from the coastal residents, slime ball!. Don’t you love the Dog and Pony Pipeline Rides “Triple Crown” by the likes of Winona LaDuke who holds no state or federal indian status, that shore up with murders of a native woman, as she prances around playing indian calling out Honor the Earth , LMAO at that poser big time with her side kick Marty and Goldtooth of the indigenous environmental network , Vile Cultural appropriating SCAMMERS !!!! Sierra club to date hasn’t touched “methane extraction” with all their rants about ANWAR, thou the zones are still up for debate as to which 1 percenters will get access to the hydrocarbon prospects. IEN with sidekicks such as protecthesacred that includes support from Last Real Indians, the Lakota Peoples Law Project and ShowDog, along with newcomer Choctaw Cherri , is another fine bunch , chasing the tarsands pipeline and they will move on “again” like the previous mentioned when media attention of the public is satisfied. At least C.Bellecourt and T.Nelson seem to be left out in the cold crawling around on their own, thou expect their endorsement when needed to start terrorizing for knocking up the negotiations bar for self serving decision makers. Look Who’s Head’s Popped out of the Sewer! Oct 2011 , “Chief Nelson, vice chair of the American Indian Movement, wrote Clyde Bellecourt, AIM national leader, to accept the invitation to come to Minneapolis. Chief Nelson will be in Minneapolis on Wednesday for a press conference and on Thursday at 10 a.m. and for a meeting with Occupy Minnesota. A bit of insult for injury to this update! Soros and those he funds are also , garnishing more and more support by INM groups through the side door by groups like IEN (who has received over 1/3 million from the Tides Foundation in the last 3 years) , and others granters, which are primarily targeting INM groups to focus on the xl pipeline, and to boot there are those such as Winona LaDuke with her Dog and Pony Show who voices to use venezuela Oil to supplement u.s energy needs, i.e to break away from core western oil baron tycoon control. Someone tell Wino na to Get Real!, and quit screaming , the Koch Brothers, the Koch Brothers, the Koch Brothers, who gives a flip about the Kotch Brothers, and the lot of the other surface targets used as smoke and mirrors by so called activists for the underlying layers. Gawd forbid the posers to bring those underlying factors to the surface, and they will not because it would jeopardize funding and political support for the opportunists, and if the opportunists can not see what lies beneath, they should hunt a bit more, not that it would do any good for them to come to realization, because they would still not speak up for fear of becoming TOAST! Maybe someone should give a little inch or big inch hint to root around in, like the Boar’s Head Basin Oil Barron’s that are continuously battling to secure U.S interests and resources , and then again, why bother trying to assist people who are indoctrinated to focus and sight in on lame duck surface targets. Seriously people, these are not the sharpest tools in the shed being address’d here thou they to look upon themselves as RockStar’s for activism. What a Concept ! , They could all use a little Change $$$ , Glitter Chasers eh ? Too bad those so called activist groups will not address the core of concerns, then again if they do, the likes of Rockefeller will yank thier funds/grants and shut them down. Welcome to the new age of global control with just about all assisting the globalists to develop green energy and hydrocarbon projects. That money trail is like a huge snake, with 1 percenters as the head feeding the body which includes Marxist nitwits in some instances, right down to the tail made up of everyday people who are truly concerned , that don’t get anything except a sense of pride for being what they think an activist is about. neat eh? The Mackenzie Delta & Paint Your Wagon in 2025! This entry was posted on March 31, 2013 at 5:20 pm and is filed under Uncategorized. You can follow any responses to this entry through the RSS 2.0 feed. You can leave a response, or trackback from your own site.